APPLICATIONS: Epoxy Primer is a clear, single-component epoxy primer/sealer designed to penetrate and seal porous substrates and to improve the adhesion of topcoats. Suitable for most surfaces including concrete, wood, fiberglass, steel, aluminum or asphaltic surfaces. 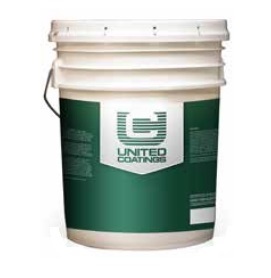 Although primer will greatly enhance the adhesion of various topcoats over metal surfaces, it is not designed to add to the corrosion resistance of the system, beyond what the topcoat provides. Epoxy Primer will effectively solidify punky or chalky concrete, masonry or roofing surfaces when used as a primer prior to topcoating. Epoxy Primer is an excellent primer for elastomeric roof coatings being applied over various surfaces. Can be used on its own as a transparent sealer over interior concrete floors to provide dustproofing and enhanced cleanability characteristics. Primer will amber slightly when used on exterior surfaces without a topcoat. 5. Cure Time: 8+ hours @ 75°F (24°C). Cure and recoating time will vary from 2 to 48 hours depending upon ambient conditions and the type of topcoat being applied. *High humidity and/or low temperature will retard cure and recoat times.